Liberty Link: Guess Where Seattle’s Police Drones Ended Up? Have you wondered where Seattle’s police drones are? How about … Los Angeles? 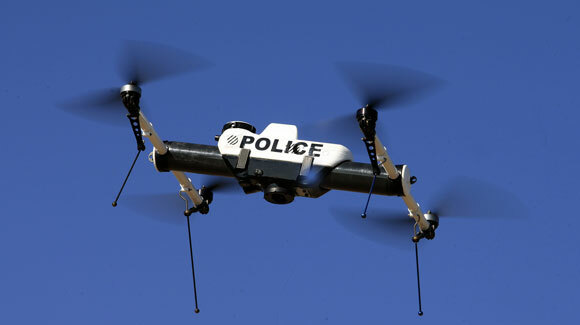 In an aptly named article “Game of Drones” in the LA Weekly, Seattle journalist Rick Anderson chronicles how the Los Angeles Police Department acquired the two 3.5 Draganflyer X6 drones as a gift from the Seattle Police Department. The SPD had obtained them via a federal Homeland Security grant, but the ensuing uproar over lack of public input, absence of regulations, and possible uses of the vehicles led then-Mayor McGinn to shelve the drone project 2012. Unloading the drones proved far from easy. While the mayor said the city simply would return the unmanned aerial vehicles, the manufacturer refused to take them back. Seattle then tried to lend a drone to King County, but astute Sheriff John Urquhart gave it back. Now Los Angeles police are hoping to avoid Seattle’s controversy by promising to hold public hearings and develop strict protocols for usage. Though as critics are pointing out, police have already obtained the drones without public debate. The ACLU in Lost Angeles has been speaking up about the risks to privacy they pose. Here in Washington, the ACLU-WA has stressed that while drones have beneficial uses, they give government unprecedented abilities to engage in surveillance of the citizenry. We pressed for legislation to regulate drone use statewide, including requiring prior approval before an agency can obtain drones and a warrant for their usage in most situations. An ACLU-backed bill regulating government drones passed both houses of the 2014 state legislature with strong bipartisan support, only to be vetoed by the Governor – who has promised to push for future enactment of drone legislation to protect privacy. To learn more about the ongoing saga of Seattle’s drones, see the LA Weekly article at http://www.laweekly.com/2014-06-19/news/game-of-drones-how-lapd-quietly-acquired-the-spy-birds-shunned-by-seattle/.